In theory, I adamantly proclaimed that if the baseball boys won States, that I will still be going to the Cape with Middle and Baby alone. In reality, I couldn't stomach not seeing any of the Regional tournament, so I'm attempting to do both--- an appetizer of baseball with a main dish of Cape vacation. In theory, our annual Cape vacation is supposed to start tomorrow. 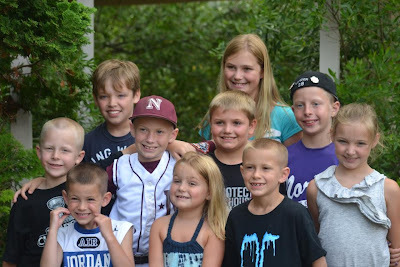 In reality, Hubby and Eldest are headed to Danbury, Connecticut today for the start of the Cal Ripken 10U New England Regional baseball tournament. (Winner? Goes to Arkansas for the World Series. Please no.) Middle, Baby and I are following tomorrow and will arrive for the first game at 3:00. In theory, my plan is to be on the Cape (a 4 hour drive from Danbury--ack!) sometime on Monday, with or without Hubby and Eldest. In reality, I'm excited to have the gang all together again! Fact: 6 of the 8 parents of these children graduated from Westfield State. Conclusion? Westfield State makes cute babies. Hope you had a great vacation and will have some sports downtime soon!